Flash Fiction Challenge : In the Martian suburbs celebrating the Red Planet’s independence. On the first night, when the clock tower in the City struck midnight, the noise was deafening. Beings all over the planet celebrated with such fervor you’d have thought they were part of the Governing Board who had negotiated the independence of Mars. Fireworks filled the night so brightly, they could be seen throughout all of the surrounding suburbs. The every announcer on every channel on the telemonitors rejoiced with the newly declared independence, flashing pictures of the partying downtown, and a few of the fulsome members of the Board. The second night came and festivals were set up throughout the planet. Young and old alike came out to make merry with their friends and family. After over two hundred years of struggle, it was their time to shine. Come to night number three. Still fireworks light up the night, even miles outside the main city. Still streets are filled with revelers; dancing and singing with joy until the wee hours of the morning begin to creep into the sky. For most, this is a celebration they have waited their lifetimes to see. For others, they don’t know of a time where they didn’t strive toward independence. The people of Mars are a proud species. And to those who agreed to allow them to join the Universal Alliance as a United Planet, they are revered as a people whose determination and dedication to what they believed in deserved this honor. Qix stared at the ceiling, taking another deep breath to try to calm his anger. BOOM! Another explosion in the sky was followed by a shower of light. He rolled on his side away from the window; huffing and tugging on the sheet. “Why are you so troubled, Qix?” The softness of his wife’s voice was welcome. “Sorry to wake you, Otha.” Qix sat up in bed, placing all of his feet on the floor and rubbed his face and ears. She placed her hand on her husband’s back, caressing his fur in hopes to soothe him. “WE are not independent, Otha. Out here? Out where the working class lives…” He bounced out of bed and paced the floor. Another boom, followed by an illuminated spray, briefly lit up their bedroom. “Hush, Qix! The kids.” Again he huffed in frustration. Qix stood at the window, leaning against its sill, staring outside in silence. Otha waited as long as she could stand before climbing out of bed to snuggle up and put an arm around him. “Tell me.” She sweetly coaxed. “What is really upsetting you?” When he didn’t respond, she slipped a finger under his chin lifting his violet eyes into view. “Qix.” She begged. “Oh.” Otha now understood the worry that plagued her husband. 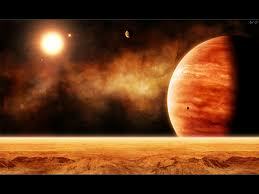 As part of the agreement for allowing independence, Mars needed to allow their planet to be open to other worlds. Many people were excited at the prospect of learning from other species; to see what new milestones could be reached in science and industry. Otha knew to Qix, the Regime simply mean not just working with Martians. Qix would be thrown into a whole new setting with beings from other planets and other walks of life that were not his own. “I … I told him I would think about it. I need to give him an answer in the morning.” He sat back on the edge of the bed again. Qix looked at her with surprise. “But, if you miss out on an opportunity to better your position and better your family because you’re –“ She stopped before uttering the words. Otha wanted to encourage, not emasculate. Qix looked into the loving eyes of his wife as she smiled up at him. He didn’t want to disappoint her. He wanted to give her and their kids everything he didn’t have as a child. He wished his father had lived long enough to be a part of this. To see what the Martians had accomplished. Suddenly, Neb and Behz burst through the door. “Did you see that? !” Neb shouted as he pointed out the window. “What are you two doing up?” Ohta asked. “I told him not to come in here, Mom.” Behz crossed her arms and tapped two of her feet like a bossy big sister would. Qix snatched his daughter into his arms and hugged her tight. “Well thank you, Miss Behz, for being such a good big sister.” He ruffled her fur and nuzzled her until she giggled. Neb rolled his eyes and shook his head, turning his focus back to the window.